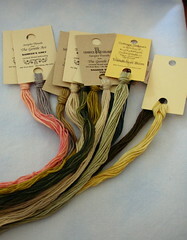 Threads for Blackbird Design's Summer House. The fabric is Summer Sky hand-dyed Jobelan, which I already had. 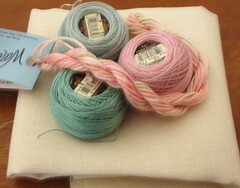 Katie from Fils'Harmonie stitched Summer House on blue and I loved it! The blue I've chosen is brighter than hers, but I think it will still look pretty - at least I hope! 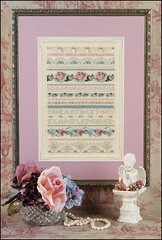 :) Here's a link to her picture trail album - scroll down to see finished pic. 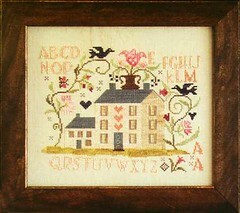 edited to add: I found another Summer House stitched on blue linen on Bea's blog Les Broderies de Bea (scroll up to view). 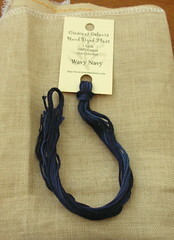 Crescent Color's Wavy Navy and 36 ct. Creme Brulee linen (already had fabric)for the The Goode Huswife's Samplers pattern. 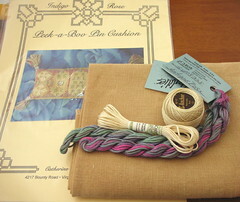 Anchor Pearl cotton and Silk threads for Indigo Rose's Peek-a-Boo cushion chart. 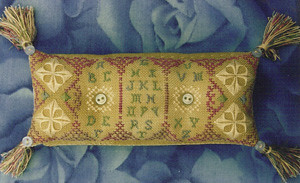 DMC Perle Cotton and Waterlilies Silk for Just Nan's Cynthia's Sampler (fabric is 32 ct. Cream Belfast). 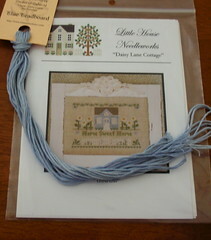 Little House Needleworks Daisy Lane Cottage with Crescent Colors Blue Beadboard thread. What lovely mail! I love getting stash in the mail. That peek a boo cushion looks like an interesting place to start. They're all great projects, several I have myself! I'd have a hard time choosing too!